SimpleServer for Android version (SimpleServer.apk), is known to occasionally close/stop connection on its own when minimized. Cutting off all possible connections, leaving you with the only option of having to restart it. 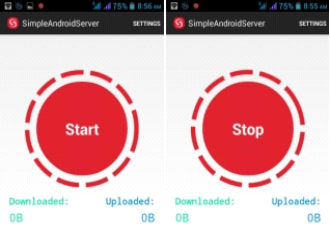 And normally, SimpleServer is one of the great app on Android/PC that enables you, to make use of data/megabytes restricted by your network, to be used on a particular website, App, devices etc, on any gadget/website of choice. Example of this data plans are MTN Music Free Data of 150MB, MTN Jumia Free Data of 700MB, FB0 Tweak, Mtn Night Plan and the current blazing MTN Bis for both PC and Android Devices. This could be as a result of your phone RAM being too low to keep simple sever running. And happens mostly on phones with 512mb Ram. Which is same reason why majority are victims, since we most at times depend on this Cheap Android phones. To stop simpleServer from closing unnecessarily on Android, we use an already existing method used to lock Apps to phone RAM. By locking Apps to an Android phone ram, the App is given a fair share of your phone ram, and not allowed to close on its own on less you close it yourself. ==> Run Xposed installer, and click on Framework. ==> Install Update and Reboot your device as prompted. ==> Click on Modules and tick App settings. This should enable the App settings option. ==> Select the App you wish to lock to RAM. In this case, you will have to select Simple sever from the list. Save your settings using the button at the top right corner of the windows and click back to return to Apps list. Did you notice anything?? The SimpleServer is now marked in Red meaning you are good to go. You can use this same procedure to stop any App from closing on its own. The SimpleServer App interface will now look a bit smaller than it used to be. So when you notice this, don’t panic. As its as a result of the little hack you carried out above. And it doesn’t end there, any app you use this method on will have smaller interface just like the SimpleServer.